This well-heeled iconic celebrity proves that brains, beauty and philanthropy are a powerful combination. 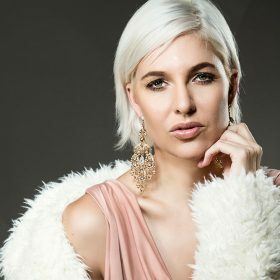 As a multi-talented keynote speaker, global master of ceremonies, radio & TV presenter, model, voiceover artist, blogger, and actress, Liezel is also Glass Recycling SA’s brand ambassador. Fitness fanatic Liezel believes sport and schooling go hand-in-hand; she continues to shape young minds on a daily basis in collaboration with Cape Town-based charity, Velokaya. We always love it when Liezel visits. Her infectious smile and generous spirit make her a firm favourite with our stylists, apprentices and beauty technicians. With an intimate understanding of her busy work schedule and demanding fitness regime, we ensure the proper care and maintenance of her hair as well as keeping her lashes and nails looking fresh. Best of all, Liezel’s adventurous approach to hairstyling and never-ending invitations to the hottest events consistently tests our exacting craftsmanship. I love how my short hair can be transformed into almost any style thanks to the creative team at Palladium. From shaving Table Mountain into my hair as well as shaving the pink ribbon into my hair for breast cancer month, to playing around with various hair colours, lengths & braids, it is always exciting to see what the Palladium team will create next!